A musical tribute to Fernie's favourite mascot. On a vast trajectory that spans 11,000km of Northern China, Chad Sayers and Forrest Coots touch down into the rich past and dizzying future of these two respective Chinese ski cultures. As one rapidly expands, they find the other is at risk of disappearing. Presented by Arc'teryx in association with Gore-Tex. Maule Dhan Rai is the last man in the remote Nepal village of Saadi who's been visited in a dream by a wrathful forest spirit called Rongkemi. If no one else in the village has the dream, a generations-old tradition of honey gathering may die. Have you ever been told you can’t do something because it's impossible? 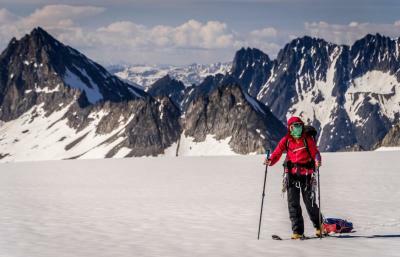 From moving metaphorical mountains to challenging the Southern BC Rocky and Purcell Mountain Ranges, Grace Brulotte shows us that disability is just a variation of the human experience. Follow an inspirational journey, captured through the lens of Kyle Hamilton and produced by Colleen Gentemann, which encourages a new perspective and redefines the meaning of possible. Follow Red Bull Kayakers Aniol Serrasolses and Nouria Newman as they paddle the rivers in British Columbia, Canada in a title-shift movie shot entirely by drone. Riding the Tatshenshini documents the journey of local BC talents, ‘The Godfather’ of freeriding Wade Simmons and Darren ‘The Claw’ Berrecloth, as well as slopestyle pioneer Tyler McCaul and rookie Carson Storch of the US, as they set into untapped terrain to trek, camp and bike in the Yukon and BC’s northern wilderness. Self-shot and edited whilst cycling around the world, this short film charts Ben Page's winter journey into the Canadian Arctic as he completed his bike ride up the American continent. Compelled by Jack London’s assertion, that ‘any man who is a man can travel alone’, he sought an adventure of perfect solitude. Yet, as he came to realise, the harsh truths of travelling in such a formidable environment were a long way from the romantic images he’d held of this land. Alexandra Armstrong loves to ski. But that passion comes at a price. Sacrificing financial stability and a permanent address to chase the dream. Alexandra works hard all summer to ski all winter. Outdoor Research and Petzl presents this Louder Than Eleven film featuring Gordon McArthur and his battle with the world's hardest dry tooling route. Join Gord and his partner Noah as they spend 2 years developing, working, training, and establishing what could be the most difficult dry tooling climb ever completed. 80 meters of horizontal roof climbing make this monster of a cave outside of Fernie, British Columbia one of the most impressive first ascents out there. Hailed as one of the most influential climbers of all time, Fred Beckey is the original "Dirtbag" one who abandons societal norms and material comforts in pursuit of a nomadic mountaineering lifestyle. Through the 1950s and 60s, Beckey’s accomplishments exceeded anyone in the sport. He shattered records with an unparalleled string of superhuman first ascents, bushwhacking trails, and pioneering direct routes thought previously impassable. A short that attempts to articulate why Jon Wilson mountain bikes. As a young adult, Jon lost his leg to cancer. Mountain biking has played a critical role in helping him sink his teeth back into life. I am one of many who are lucky to get to call Jon a friend, as he is someone who does three important things for me in my life: he inspires me; he gives me perspective; and he puts me in my place. Coast Mountain Epic is a live multi-media presentation detailing a five and half month long ski traverse of the Coast Mountains of BC and Alaska. Undertaken from January to June of 2017 by a mother and daughter team from BC, this presentation features their challenges, close-calls, failures and successes throughout the Coast mountain Epic. Exploring the life of a backcountry skier... in Mississauga, Ontario. Will Stanhope and Matt Segal are elite-level crack climbers and world-class goofballs on a mission to conquer the world's toughest crack climb. 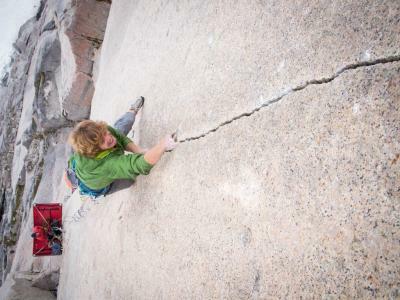 Their four-year battle in the Canadian Bugaboos will make them question everything except why they climb. After losing the love of his life, a Professional Paraglider pilot searches for meaning by embarking upon the most daring series of mountain flights in Canadian history. This short film is part of the Accelerate Kootenays initiative - a project aiming to demonstrate that the adventure-centric lifestyle can be maintained even when driving an electric car. Due to climate change, by 2050 ski seasons will be markedly shorter. Lower elevations will receive significantly less snowfall. Two veteran professional skiers contemplate the impact their love for adventure has on the very environment that sustains and fulfills them. As they peer into the future, they realize there is a more sustainable path ahead, but it won't be easy. Columbia. Just remember to bring your skates.